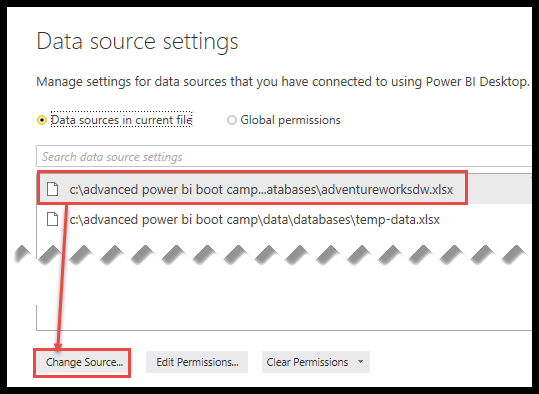 Hopefully, you don’t have to go in and change your connection strings often in Power BI, but when you do, you will want to know this little trick. In this blog I’m not going to discuss parameters, although as a developer, I love that parameters are available for administration. 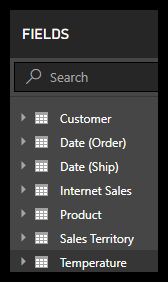 Even better, the use of parameters in Power BI became even more powerful with the recent update to Power BI where parameters can now be changed in the Power BI Service! I will definitely do a blog or series on parameters in the near future. As a trainer, I come across the issue of needing to change connection string information quite often and this saves me a lot of time. Let’s jump right in. In this example, I have a power bi report with two separate data sources and a total of eight tables. The first data source is to an excel file with many different sheets. The second data source is a separate excel file. Imagine that both excel files get moved from one directory location to another directory location. Typically this would mean that I would need to individually update the connection information for all eight tables in my data model. However, I’m here to show you a better way. You will be making source connection changes from the Power Query Editor. Launch the Power Query Editor by clicking on “Edit Queries” found on the Home ribbon. This will launch the Power Query Editor. Next, click “Data source settings” found on the Home ribbon. This launches the Data source settings window and you will be able to see all of your connections here. If you had twelve tables all coming from the same excel file or a SQL Server database, ect… then you would only need to change one connection for all twelve tables. You get the idea! Once the file has been selected, click Open. Click OK. Now all seven tables that were pointing to that AdventureWorksDW excel file have been updated at one time. Repeat this process for any remaining data sources that may need updating and you are done!